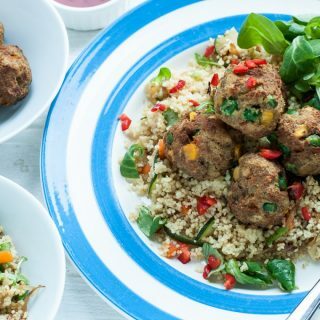 These veggie balls inspired by a certain Swedish homeware store’s canteen menu are a tasty meal versatile enough for supper or served cold as a packed lunch. Recipe commissioned by Florette, find out more below. 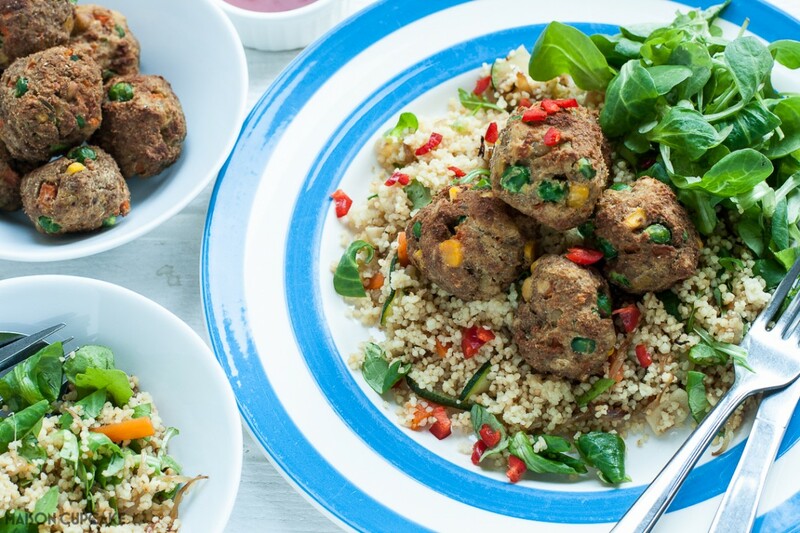 If they’ve not floated under your radar yet, the new-ish veggie balls sold in the IKEA canteen – as a vegetarian alternative to their longstanding meatballs – are extremely tasty. I keep making excuses to go back and eat them and was mortified on a recent trip when they only had them on the menu with mash or chips. Previously they were served with what’s described as a warm bulgar and kale salad. The veggie balls are actually sold in their food section and I often pick up a bag on the way home. But recently, unable to face a return trip, I attempted my own version at home and this is the result. My veggie balls are a mix of squooshed chickpeas (home soaked ones not canned because they’re softer), peas, carrots, sweetcorn, an egg, spices and dried bread crumbs. Which are then formed into balls and baked in the oven for around 20 minutes. Rather than bulgar, I am more likely to have couscous in the house and used that here. But you could use bulgar wheat if you wanted to be closer to the original recipe. I have no idea how they prepare theirs but mine is a rough guess and I was pretty pleased with the result and don’t think it’s far off. To be honest I think the greenery is obliterated in the original whereas I added roughly chopped Florette Duo Lambs Lettuce and Rocket whilst my mix of onion, garlic, couscous, courgette and carrot was still warm. 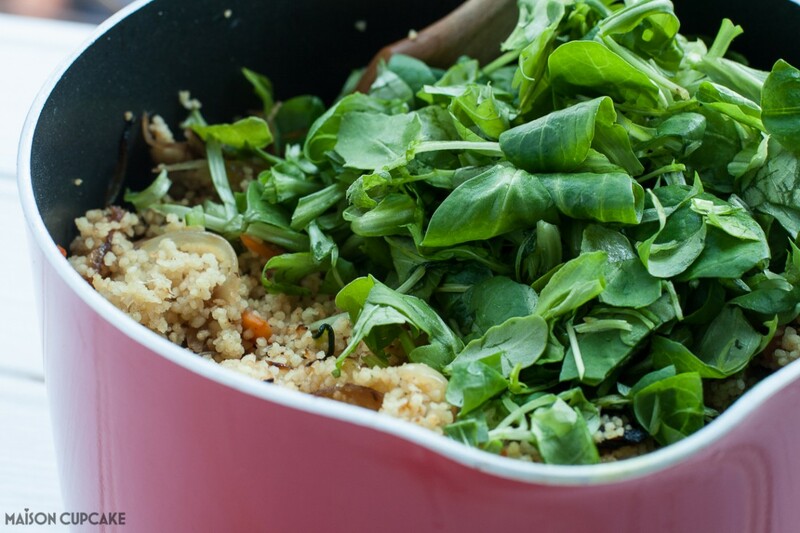 Although you might associate bagged salad leaves with summer, I find them useful all the year round and add things like rocket, spinach or watercress to pesto, soups, couscous or pasta dishes all the year round. You could also serve these veggie balls felafel style in pitta pockets where they would partner equally well with the Florette salad. Do you carry on eating salad in autumn? Tell us your favourite ideas in the comments below! Serves 4 as a main meal or 6 as a light lunch. Preheat the oven to Gas 6 / 200c. Heat the oil in a large saucepan and fry the onions and garlic until lightly brown. Set aside and fry the courgette until lightly brown too. Return the onions to the pan and add the couscous and stock. Stir until combined and reduce the heat continuing to cook with the lid on for 3-5 minutes. Then turn off the heat and leave to steam inside the pan whilst you deal with the veggie balls. 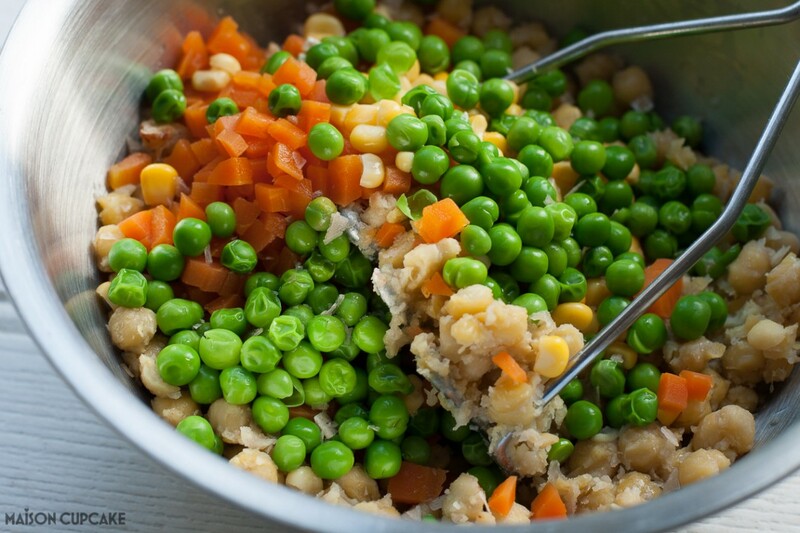 To make the veggie balls place the cooked chickpeas in a large bowl with the peas, diced carrot, sweetcorn, egg, breadcrumbs and spices. Mash the mixture lightly and when combined form it into small balls. Lay these on a baking sheet lined with baking parchment paper and bake for 15 minutes until their surface is crisp. After this time turn the balls over and return to the oven to bake on the other side for 5 minutes. When you are ready to serve, roughly chop the Florette salad and fold this into the couscous mix. 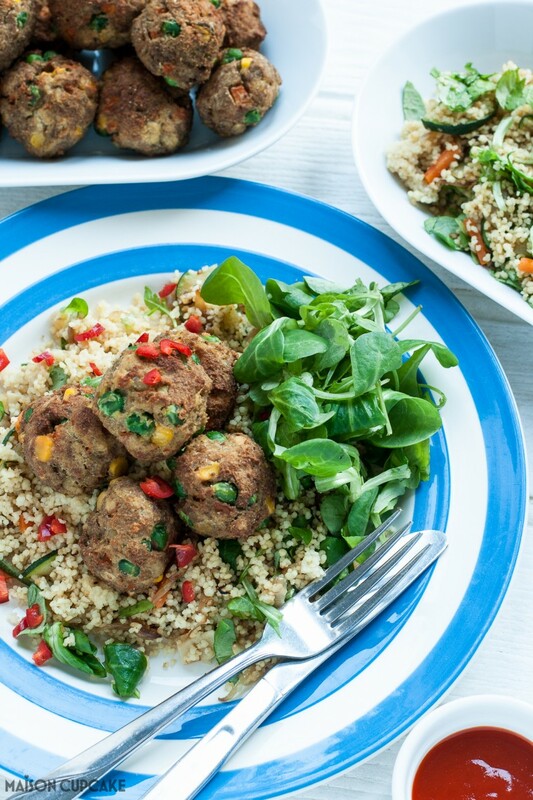 Serve the veggie balls on top of the couscous with a scattering of red chilli (optional) and extra Florette salad on the side. In place of garam masala you could use ras al-hanout or za'atar or any mild spice blend of your choice. 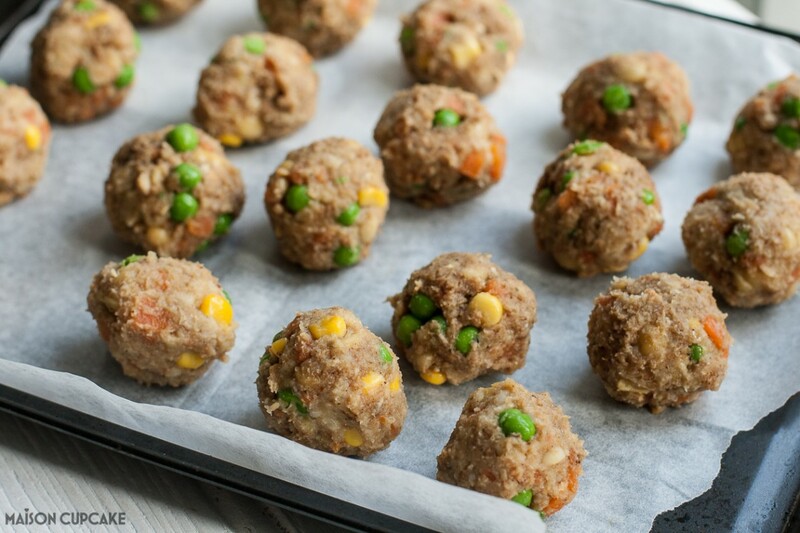 This Veggie Balls with Warm Salad recipe post was commissioned by Florette. Keep up with Florette on Instagram , Facebook and Twitter.